فرخ, مجتبی, آذر, عادل, جندقی, غلامرضا. (1395). طراحی مدل زنجیره تامین حلقه بسته با رویکرد برنامه ریزی فازی استوار جدید. پژوهش های نوین در تصمیم گیری, 1(3), 131-160. مجتبی فرخ; عادل آذر; غلامرضا جندقی. "طراحی مدل زنجیره تامین حلقه بسته با رویکرد برنامه ریزی فازی استوار جدید". پژوهش های نوین در تصمیم گیری, 1, 3, 1395, 131-160. فرخ, مجتبی, آذر, عادل, جندقی, غلامرضا. (1395). 'طراحی مدل زنجیره تامین حلقه بسته با رویکرد برنامه ریزی فازی استوار جدید', پژوهش های نوین در تصمیم گیری, 1(3), pp. 131-160. فرخ, مجتبی, آذر, عادل, جندقی, غلامرضا. طراحی مدل زنجیره تامین حلقه بسته با رویکرد برنامه ریزی فازی استوار جدید. پژوهش های نوین در تصمیم گیری, 1395; 1(3): 131-160. در سال های اخیر با توجه به افزایش اهمیت رقابت ‌پذیری اقتصادی و نگرانی ‌های زیست محیطی در زمینه محصولات فرسوده، موضوع زنجیره تامین حلقه بسته مورد توجه بسیاری از محققان قرار گرفته است. تحقیق حاضر درصدد توسعه یک رویکرد برنامه ریزی فازی استوار برای مسئله طراحی شبکه زنجیره تامین حلقه بسته تحت شرایط عدم قطعیت است. مدل پیشنهادی دارای ویژگی هایی برحسب مقدار میانگین امکانی، تغییرپذیری امکانی تابع هدف و تخطی از محدودیت های امکانی است. برای توسعه رویکرد پیشنهادی از برنامه ریزی با محدودیت های اعتبار و میانگین انحراف مطلق امکانی استفاده می شود. با استفاده از یک مثال عددی بر روی پارامترهای استواری بهینگی (تغییرپذیری امکانی) و استواری شدنی تحلیل حساسیت صورت گرفت و برای اعتبار سنجی مدل و ارزیابی استواری جواب های بدست آمده از مدل پیشنهادی، پارامترهای مدل10 بار به طور تصادفی تولید و سپس عملکرد جواب های بدست آمده برحسب تغییرپذیری و میانگین هزینه با مدل میانگین فازی مورد مقایسه قرار می گیرد. نتایج نشان می دهد که مدل پیشنهادی قادر است با صرف یک هزینه قابل قبول استواری مدل را افزایش دهد. Abstract: In recent decade, the increasing importance of economic benefits and environmental impacts of using scrapped products has encouraged most companies to focus on the closed-loop supply chain (CLSC) design. This paper considers the problem of CLSC network design under fuzzy uncertain conditions. The uncertain source is that the values of these parameters are usually imprecise and can be specified by possibilistic variables. To handle the uncertainty, a possibilistic programming approach is an appropriate method of incorporating such uncertainty In this problem. Possibility theory is applied to choose such solution in such a problem and a robust fuzzy programming (RFP) approach is proposed. In the proposed model, the best robust decision has the additional property in terms of mean value and variability of the objective function named possibilistic variability. The performance of the proposed RFP model is also compared with that of mean model in term of the variability and mean cost of model. Devika K., Jafarian A., Nourbakhsh V. (2014) "Designing a sustainable closed-loop supply chain network based on triple bottom line approach: A comparison of metaheuristics hybridization techniques", European Journal of Operational Research, 235(3): 594-615. Beamon B. M. (1999) Designing the green supply chain. Logistics information management, 12(4): 332-342. Hatefi S. M., Jolai F. (2014) "Robust and reliable forward–reverse logistics network design under demand uncertainty and facility disruptions", Applied Mathematical Modelling, 38(9): 2630-2647. Baghalian A., Rezapour S., Farahani R. Z. (2013) "Robust supply chain network design with service level against disruptions and demand uncertainties: A real-life case", European Journal of Operational Research, 227(1): 199-215. Tabrizi B. H., Razmi J. (2013) "Introducing a mixed-integer non-linear fuzzy model for risk management in designing supply chain networks", Journal of Manufacturing Systems, 32(2): 295-307. Tang C. S. (2006) "Perspectives in supply chain risk management", International Journal of Production Economics, 103(2): 451-488. Torabi S. A., Hassini E. (2008) "An interactive possibilistic programming approach for multiple objective supply chain master planning", Fuzzy Sets and Systems, 159(2): 193-214. Mulvey J. M., Vanderbei R. J., Zenios S. A. (1995) "Robust optimization of large-scale systems", Operations Research, 43(2): 264-281. Zhang W. G., Wang Y. L., Chen Z. P., Nie Z. K. (2007) "Possibilistic mean–variance models and efficient frontiers for portfolio selection problem", Information Sciences, 177(13): 2787-2801. Keyvanshokooh E., Ryan S. M., Kabir E. (2016) "Hybrid robust and stochastic optimization for closed-loop supply chain network design using accelerated Benders decomposition", European Journal of Operational Research, 249(1): 76-92. El-Sayed M., Afia, N., El-Kharbotly A. (2010) "A stochastic model for forward–reverse logistics network design under risk", Computers & Industrial Engineering, 58(3): 423-431. Wang H. F., Hsu, H. W. (2010) "A closed-loop logistic model with a spanning-tree based genetic algorithm", Computers & Operations research, 37(2): 376-389. Üster H., Easwaran G., Akçali E., Cetinkaya S. (2007) "Benders decomposition with alternative multiple cuts for a multi‐product closed‐loop supply chain network design model", Naval Research Logistics (NRL), 54(8: 890-907. Ko H. J., Evans G. W. (2007) "A genetic algorithm-based heuristic for the dynamic integrated forward/reverse logistics network for 3PLs", Computers & Operations Research, 34(2): 346-366. Ramezani M., Bashiri M., Tavakkoli-Moghaddam R. (2013) "A new multi-objective stochastic model for a forward/reverse logistic network design with responsiveness and quality level", Applied Mathematical Modelling, 37(1): 328-344. Tehrani M. S., Hassanpour H., Ramezani S. (2015) "Cost and carbon dioxide two objective optimization model in closed loop supply chain", Journal of Management Research in Iran.19: 169-189. (in Persian). Zeballos L. J., Méndez C. A., Barbosa-Povoa A. P., Novais A. Q. (2014) "Multi-period design and planning of closed-loop supply chains with uncertain supply and demand", Computers & Chemical Engineering, 66: 151-164. Pishvaee M. S., Torabi S. A. (2010) "A possibilistic programming approach for closed-loop supply chain network design under uncertainty", Fuzzy Sets and Systems, 161(20): 2668-2683. 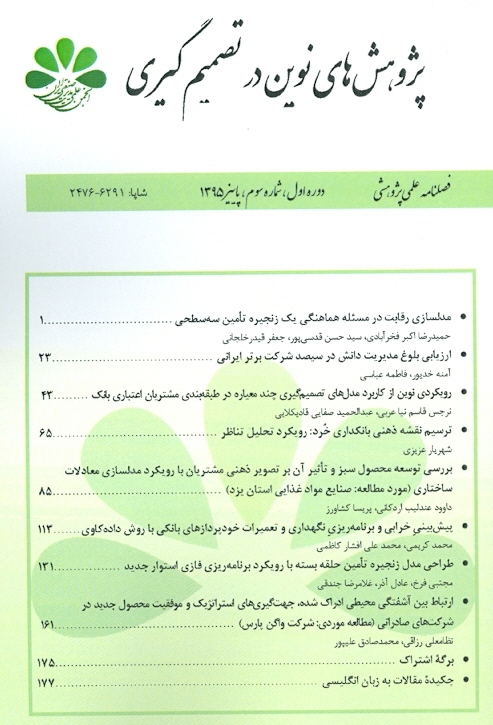 Azar A., Hassanpour H., Rabieh M., Modarresyazdi M., Fetanatfard M. (2011) "Fuzzy-robust multi objective sourcing mathematical model in supply chain risk management of Iran Khodro", Journal of Management Research in Iran.15: 51-76, (in Persian). Pishvaee M. S., Rabbani M., Torabi S. A. (2011) "A robust optimization approach to closed-loop supply chain network design under uncertainty", Applied Mathematical Modelling, 35(2): 637-649. Pishvaee M. S., Razmi J., Torabi S. A. (2012) "Robust possibilistic programming for socially responsible supply chain network design: A new approach", Fuzzy Sets and Systems, 206: 1-20. Snyder L. V. (2006) "Facility location under uncertainty: a review", IIE Transactions, 38(7): 547-564. Ramezani M., Bashiri M., Tavakkoli-Moghaddam R. (2013) "A robust design for a closed-loop supply chain network under an uncertain environment", The International Journal of Advanced Manufacturing Technology, 66(5-8): 825-843. Pan F., Nagi R. (2010) "Robust supply chain design under uncertain demand in agile manufacturing", Computers & Operations Research, 37(4): 668-683. Zhang W. G., Xiao W. L. (2009) "On weighted lower and upper possibilistic means and variances of fuzzy numbers and its application in decision", Knowledge and Information Systems, 18(3): 311-330. Zhang P., Zhang W. G. (2014) "Multiperiod mean absolute deviation fuzzy portfolio selection model with risk control and cardinality constraints", Fuzzy Sets and Systems, 255: 74-91. Klibi W., Martel A. (2013) "The design of robust value-creating supply chain networks", OR Spectrum, 35(4): 867-903. Govindan K., Fattahi M. (2015) "Investigating risk and robustness measures for supply chain network design under demand uncertainty: A case study of glass supply chain", International Journal of Production Economics. Carlsson C., Fullér R. (2001) "On possibilistic mean value and variance of fuzzy numbers", Fuzzy sets and Systems, 122(2): 315-326. Zadeh L. A. (1978) "Fuzzy sets as a basis for a theory of possibility", Fuzzy Sets and Systems, 1(1): 3-28. Dubois D., Prade H. (1980) "Systems of linear fuzzy constraints", Fuzzy Sets and Systems, 3(1): 37-48. Inuiguchi M., Ichihashi H., Tanaka H. (1990) "Fuzzy programming: A survey of recent developments", In Stochastic Versus Fuzzy Approaches to Multi Objective Mathematical Programming Under Uncertainty (pp. 45-68), Springer Netherlands. Liu B., Liu Y. K. (2002) "Expected value of fuzzy variable and fuzzy expected value models", Fuzzy Systems, IEEE Transactions on, 10(4): 445-450. Liu B. (2004) Uncertainty theory: An introduction to its axiomatic foundations. Liu B., Iwamura K. (1998) "Chance constrained programming with fuzzy parameters", Fuzzy Sets and Systems, 94(2): 227-237.